Is there anything more American than the classic shake and burger? Yes, actually: souped up shakes, binge-worthy burgers, and Back to the Future playing on a hi-res tv -- all things that can be found at The Shake and Burger Bar, a new sports bar and grill in Kips Bay, Manhattan. I admit, walking into The Shake and Burger Bar, I wasn’t sure what to expect -- hipsters wanting pics for their socials? An older, mostly male crowd catching up on the game? Who I got as dining companions, however, were a different, unexpected group: families with young children, no doubt drawn to the abundance kid friendly items featured on the menu: mozzarella sticks, sliders, and of course, milkshakes. But the food at The Shake and Burger Bar is much more than your nostalgic childhood fare. Take the mac and cheese -- slightly soupy, and customized with either truffle oil or bacon bits, this appetizer stole the show as soon as it was placed at our table. Served in a generously sized cast iron pan and finished with a layer of bubbling cheese, I burned my tongue rushing to get a second bite after being overwhelmed by the first, and spent the rest of the course glopping forkfuls of the dish onto my own plate. The truffle Mac & Cheese, which I cannot recommend enough, is also featured on the burger menu, as part of the Truffle Mac & Cheese Burger. I, however, went for the Left Coast Turkey Burger, served on an activated charcoal bun, while my friend gorged on the giant, cheese covered Surf N Turf. While both burgers were well made, and definitely filling, they were outshone by the sweet potato fries, which came dusted with brown sugar and served with a marshmallow dipping sauce. I am now a firm believer that this is the way all sweet potato fries should be enjoyed. Yes, the fries are sweet, but hey, if marshmallow topped sweet potato casserole can fly at Thanksgiving, marshmallow dipped sweet potato fries can work for lunch. 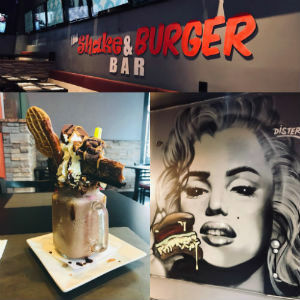 Nevertheless, The Shake and Burger Bar does offer regular fries and onion rings as sides to their burgers, especially if you’re saving your sweet tooth for the eatery’s biggest draw: their milkshakes, divided into either Drunk Shakes or Insane Shakes. Be forewarned: You will not be able to finish your milkshake, particularly if you’ve been munching away at all the other goodies The Shake and Burger Bar has to offer. The Juniors Cheesecake Raspberry shake I ordered came topped with a slice of Juniors Cheesecake, whipped cream, donut holes, and graham crackers. I ended up having to take the toppings and shake to go, and it held up well on the train ride back home, where I spent the next two days alternating between gulps of the milkshake and the bites of the cheesecake. So, who is The Shake and Burger Bar for? The answer may not be too clear from the atmosphere, but I think I’ve derived an answer from the menu: anyone that is fond of fun, flavorful food.